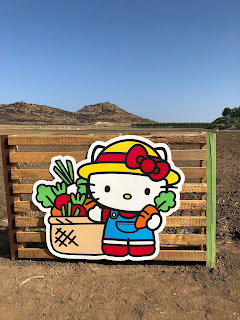 it's been awhile since i got to do anything hello kitty-related, hasn't it? 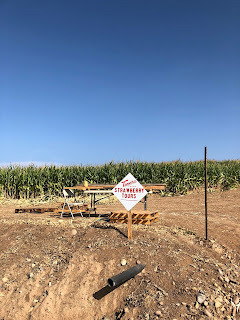 at least it seems like it has. 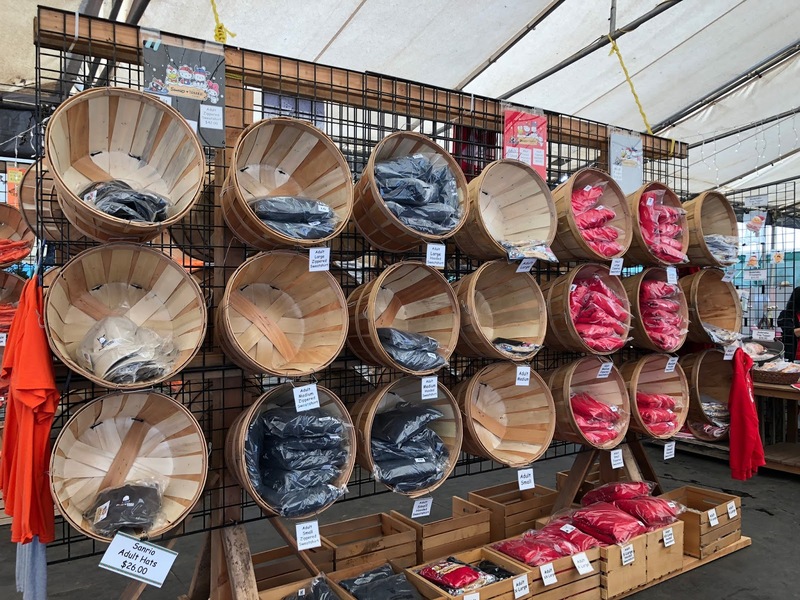 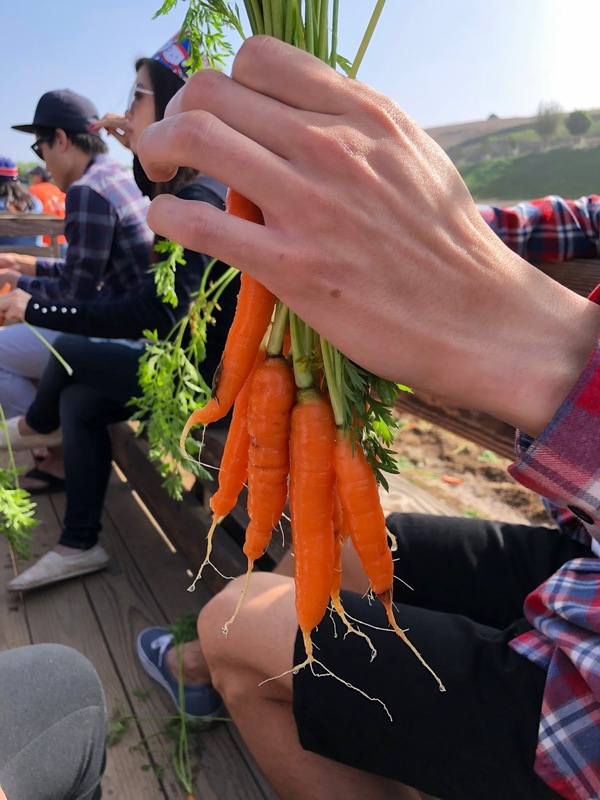 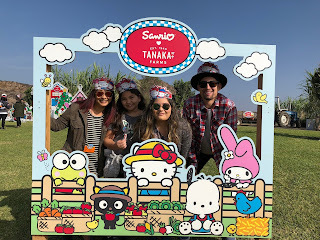 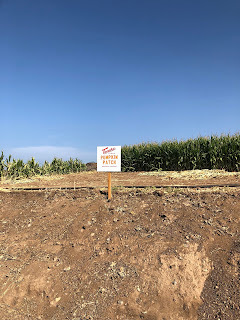 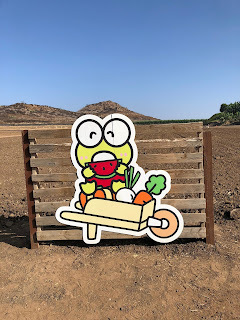 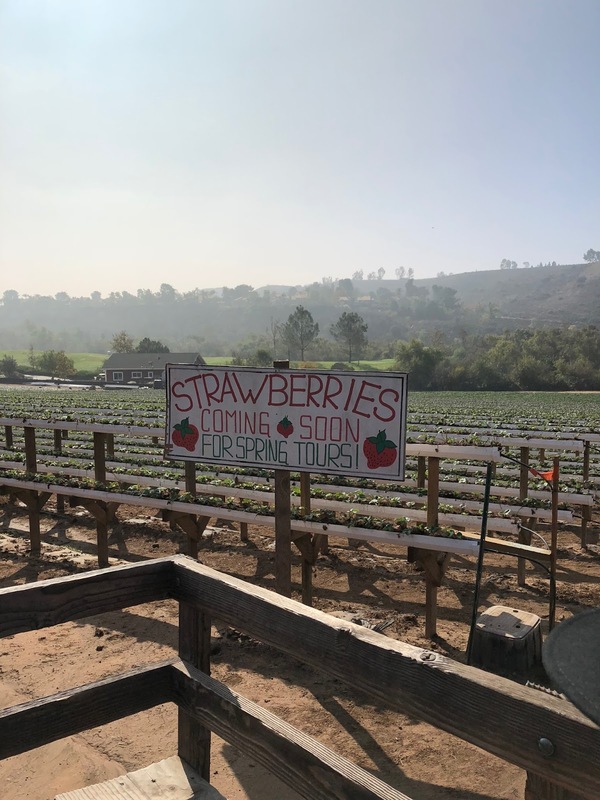 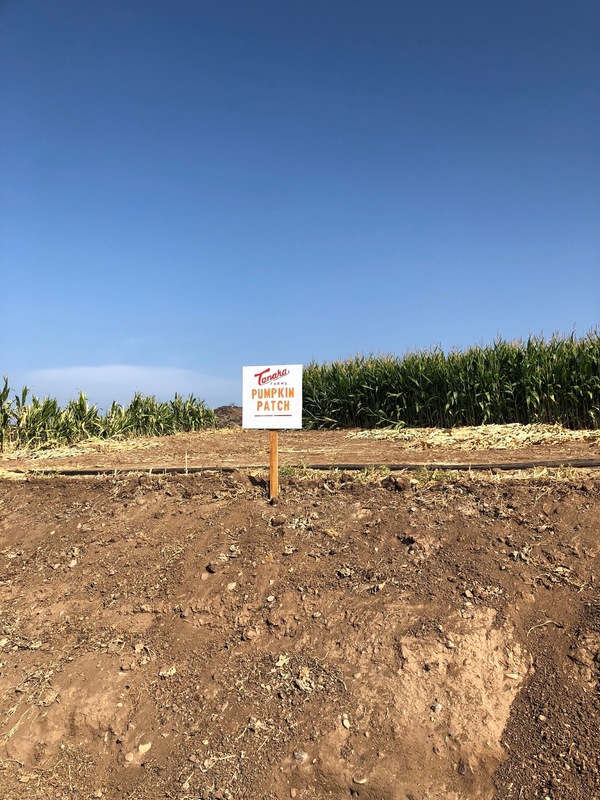 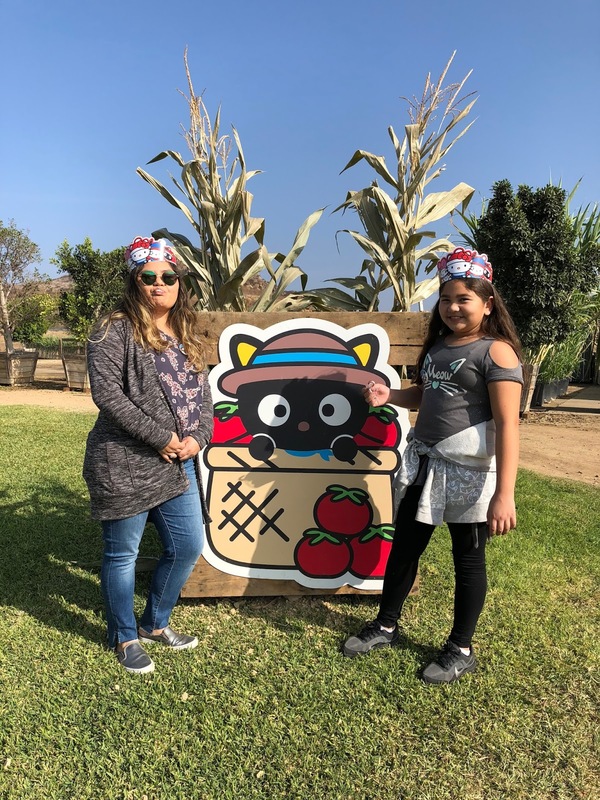 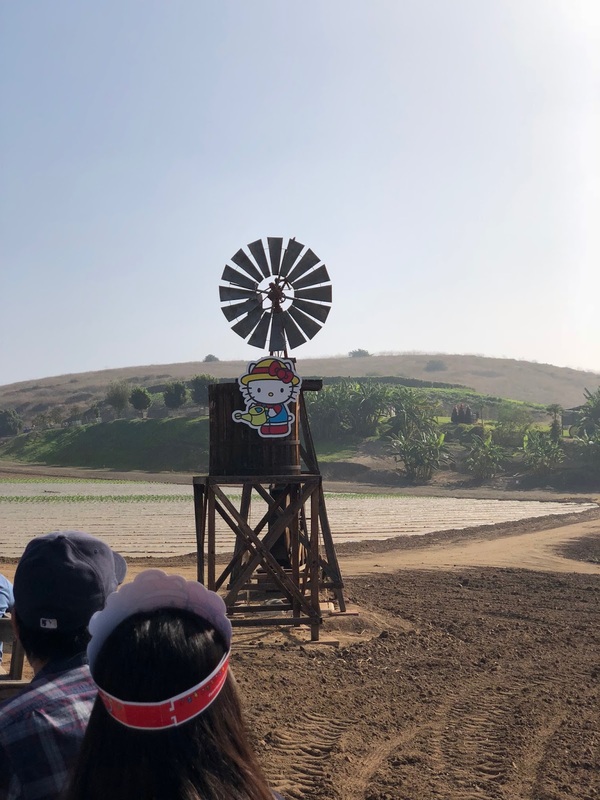 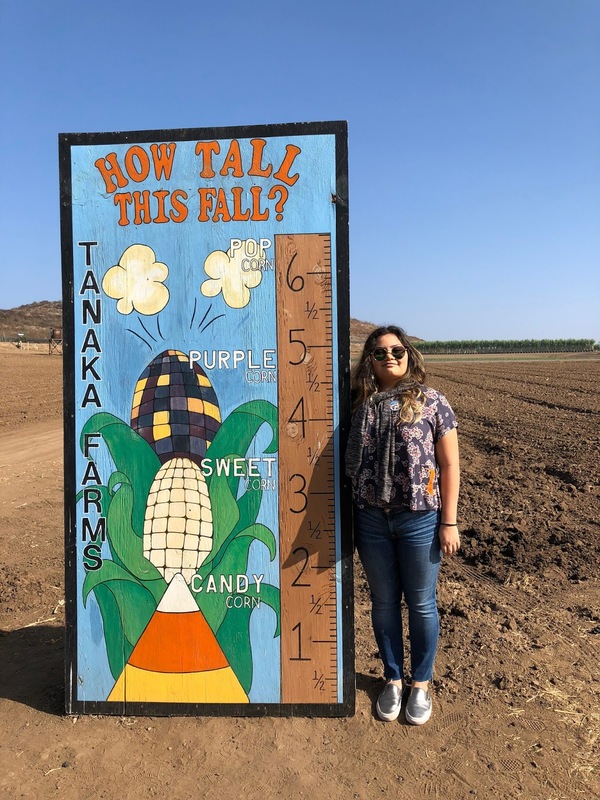 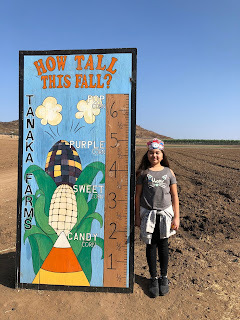 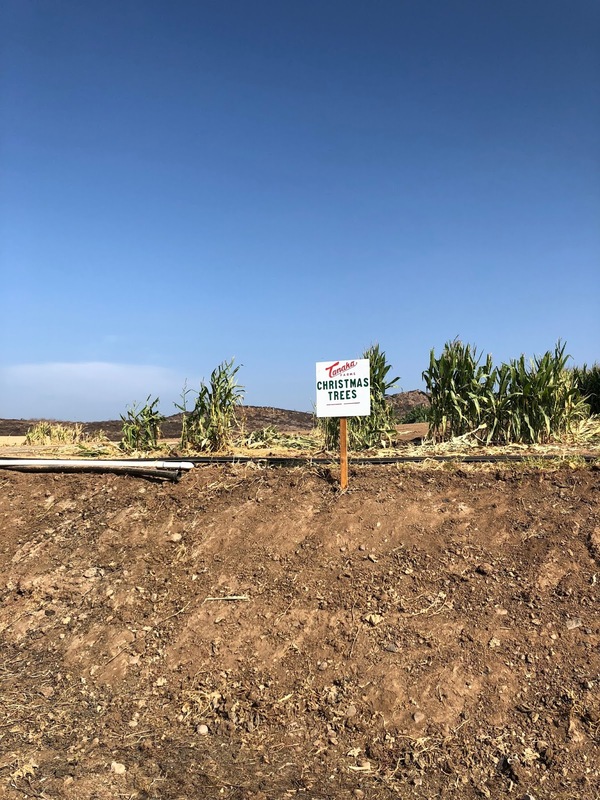 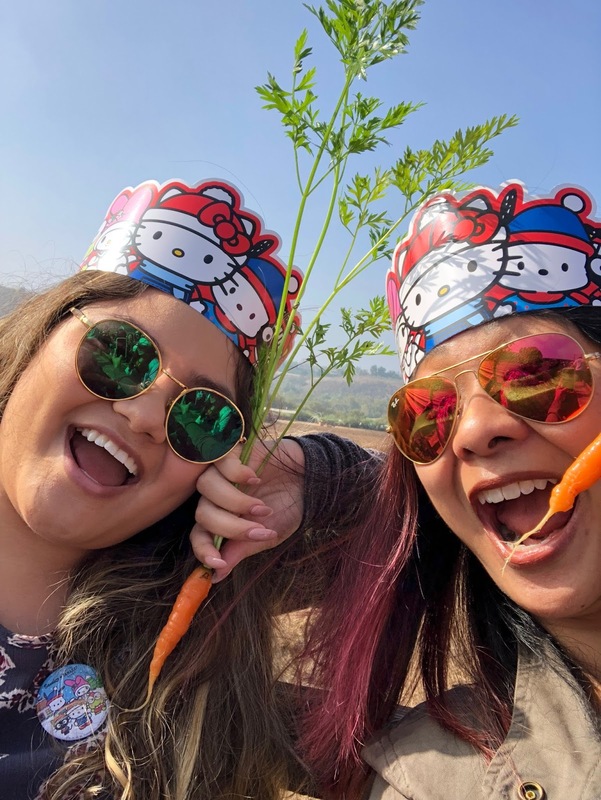 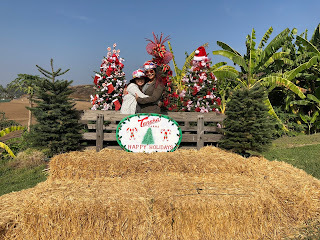 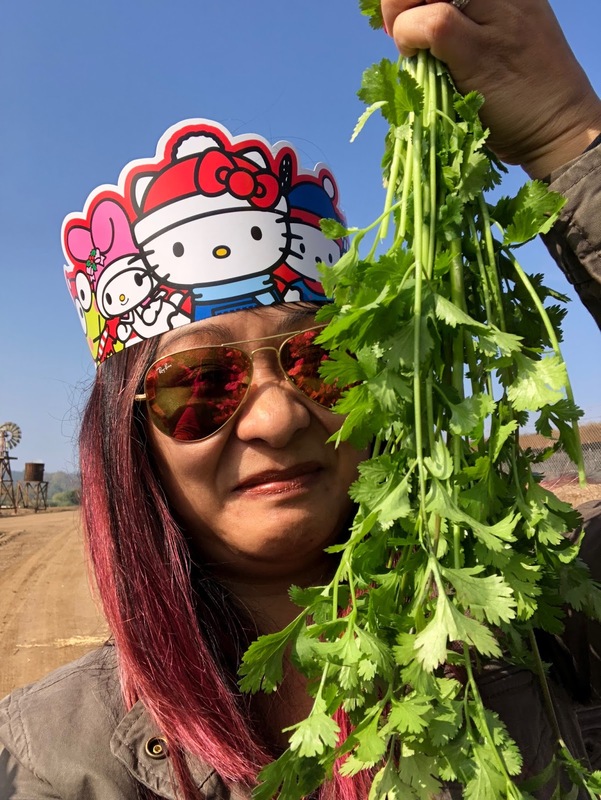 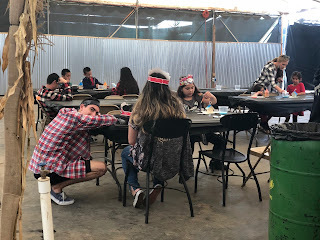 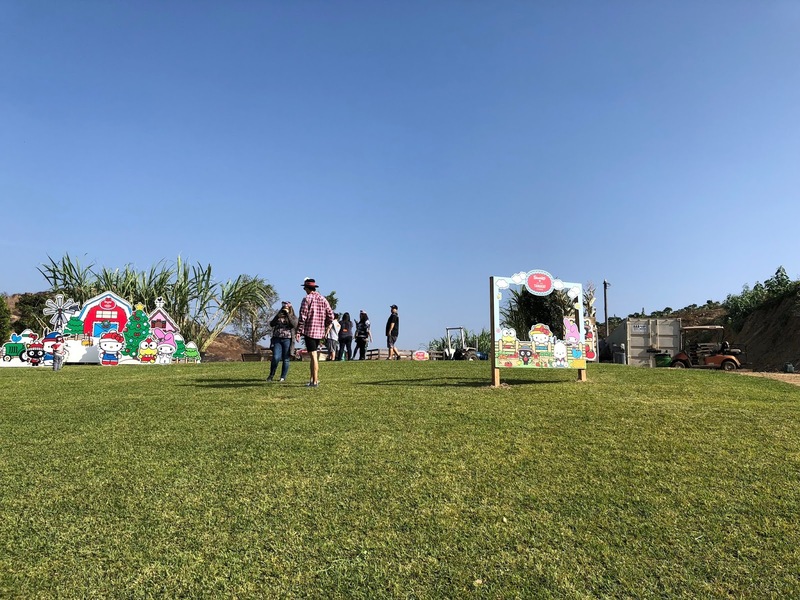 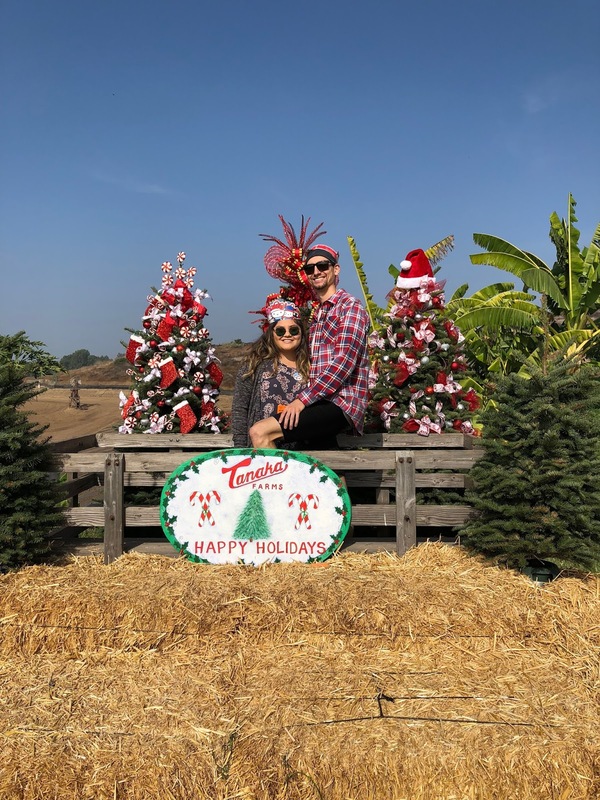 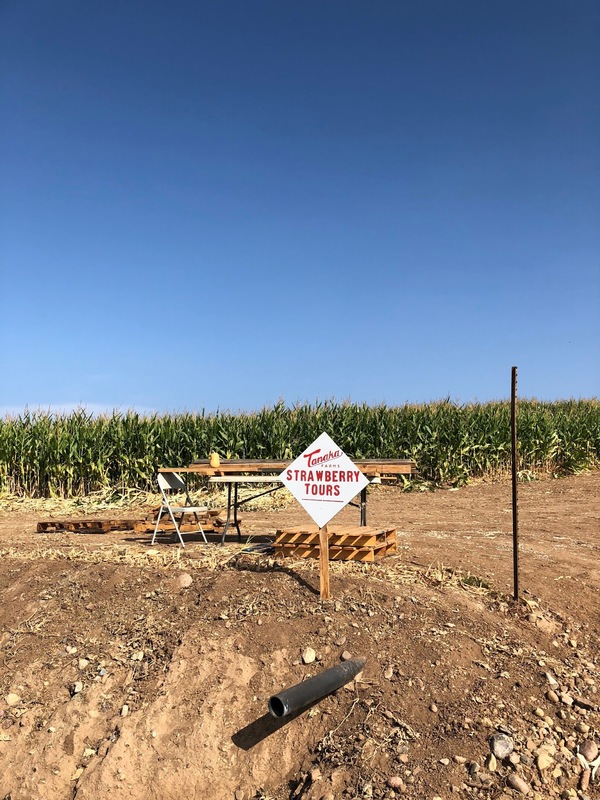 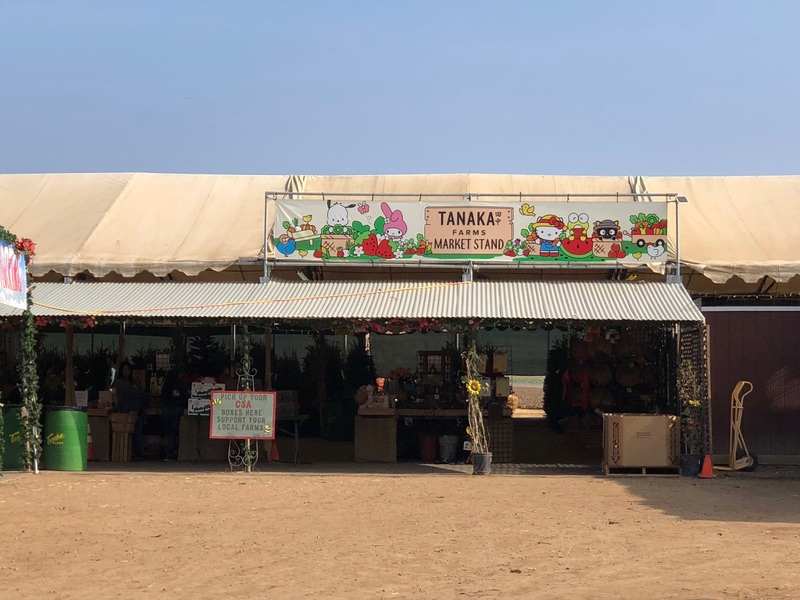 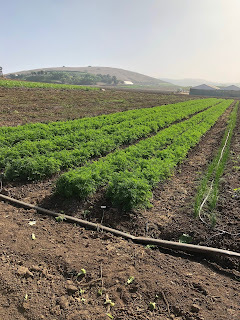 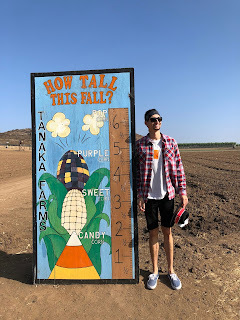 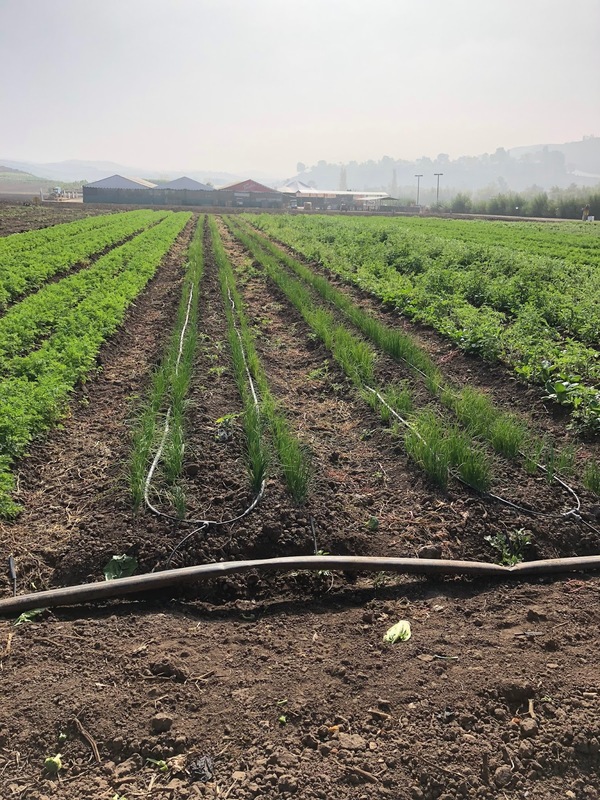 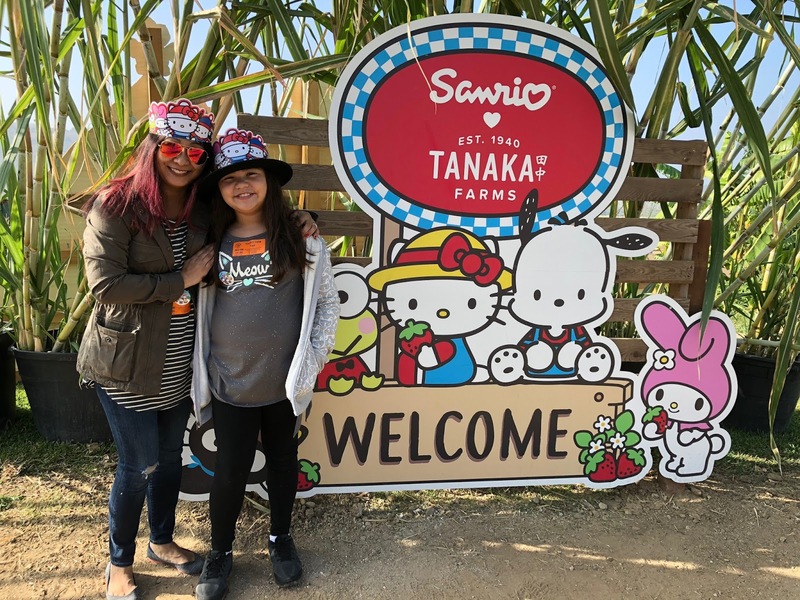 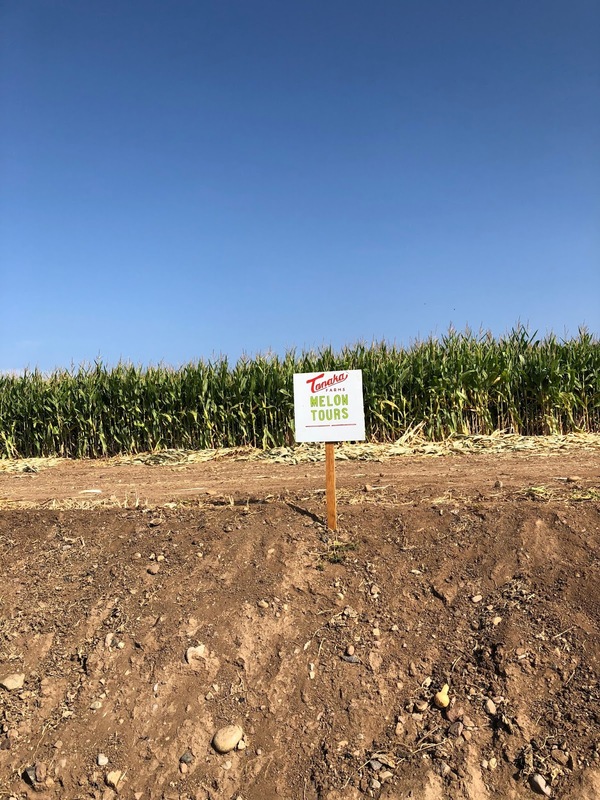 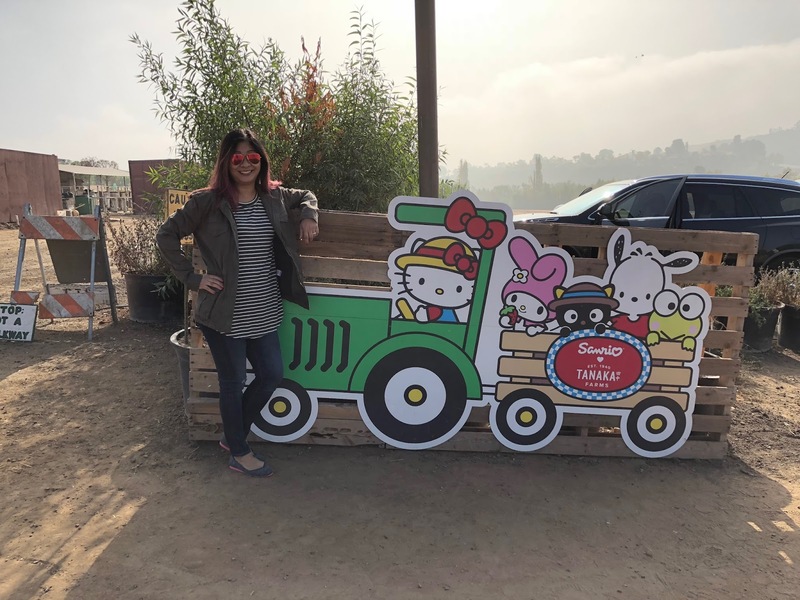 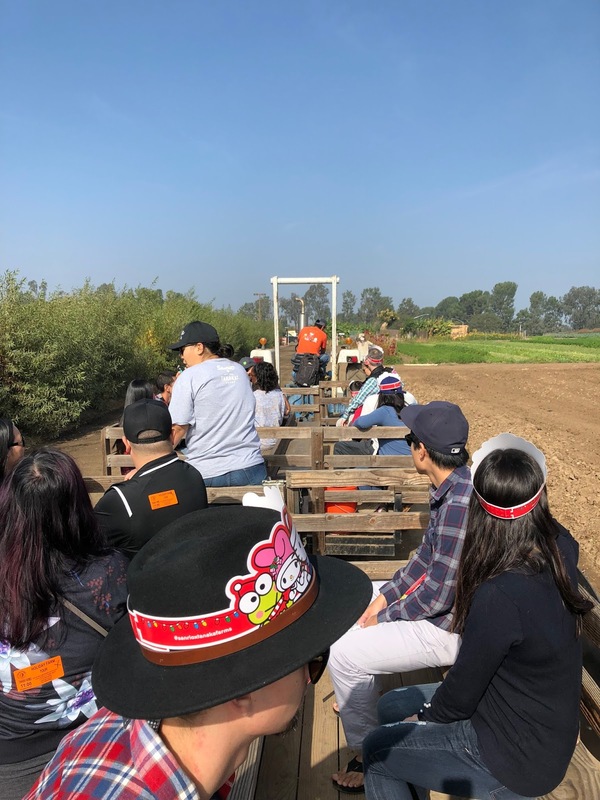 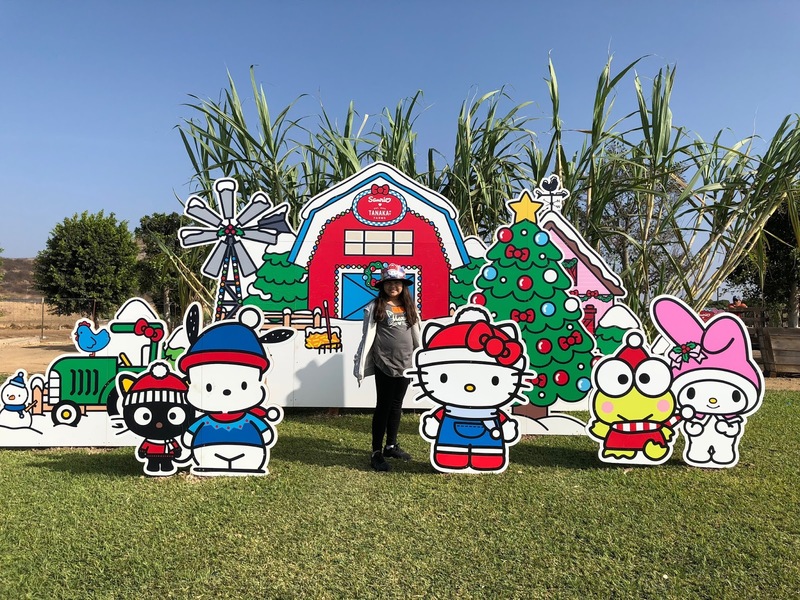 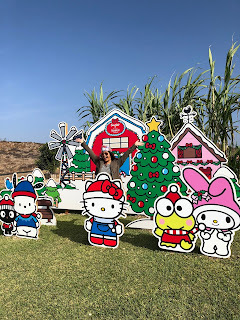 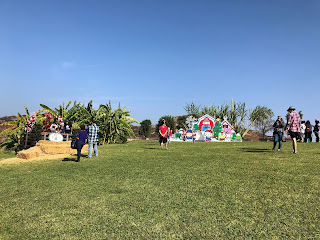 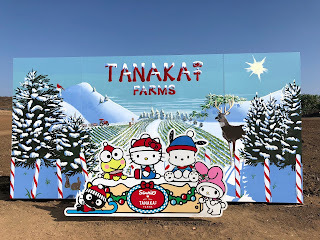 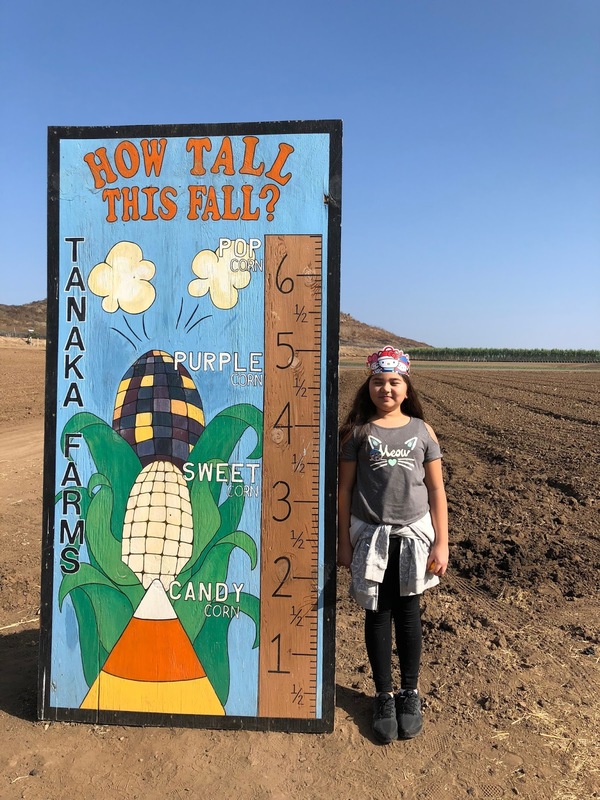 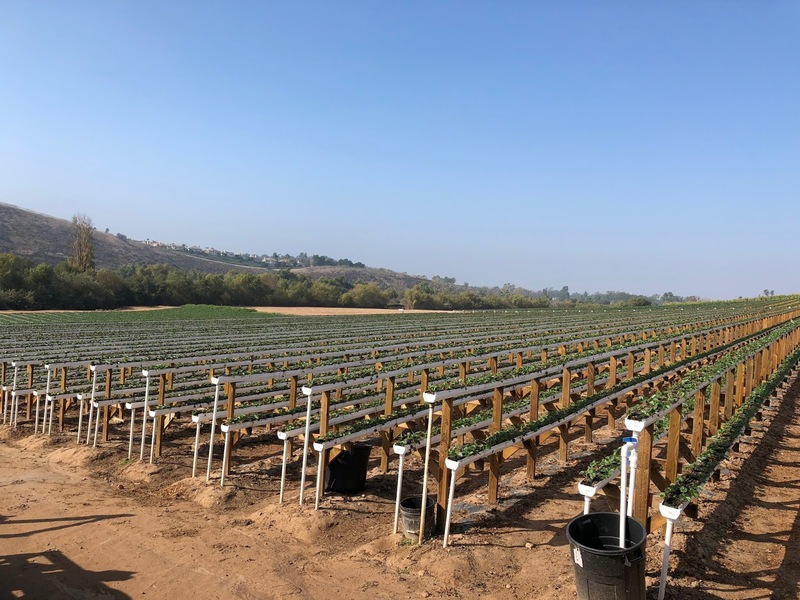 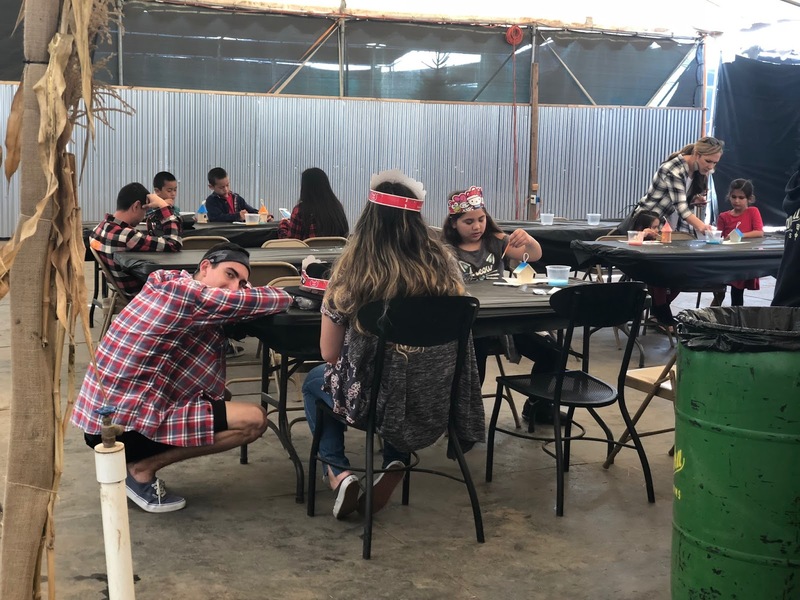 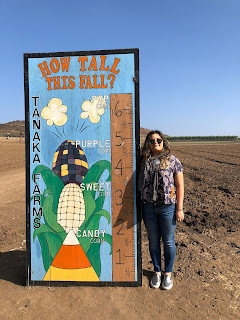 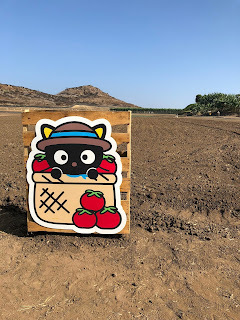 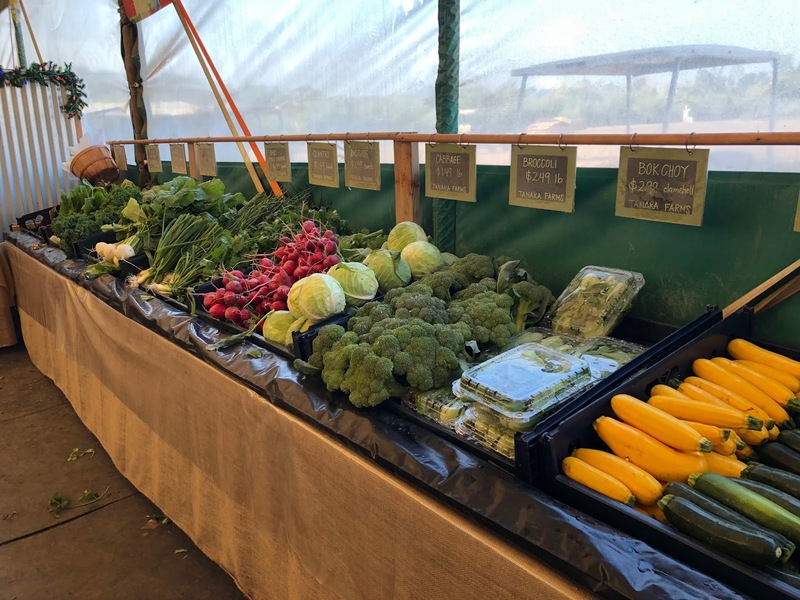 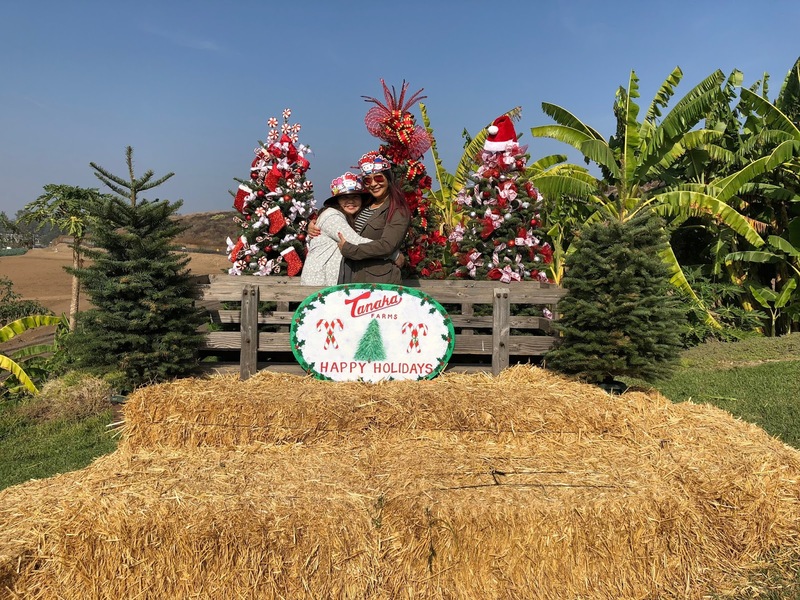 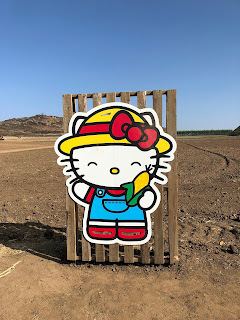 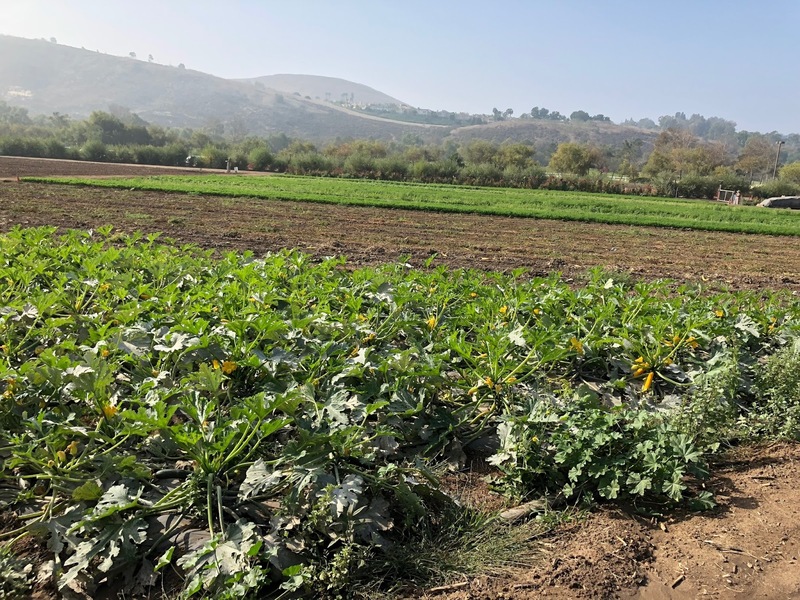 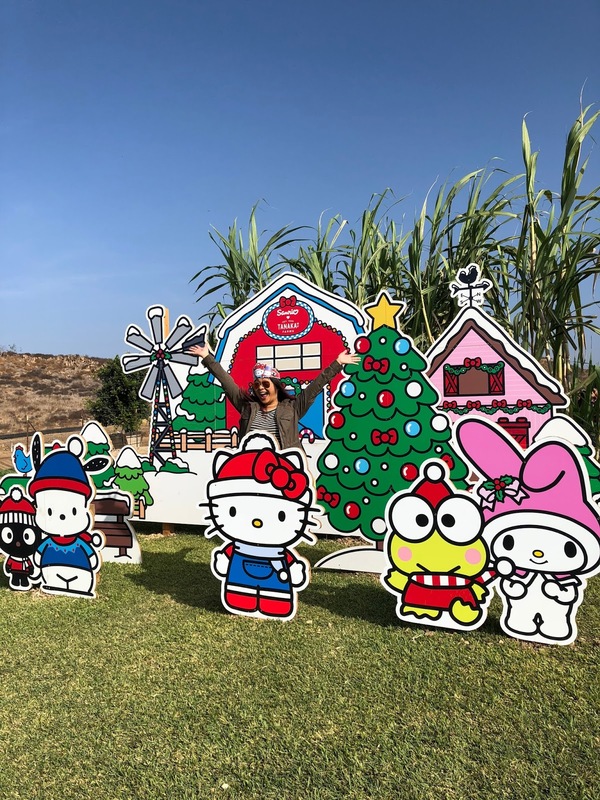 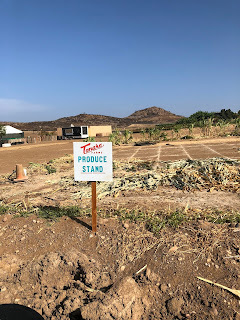 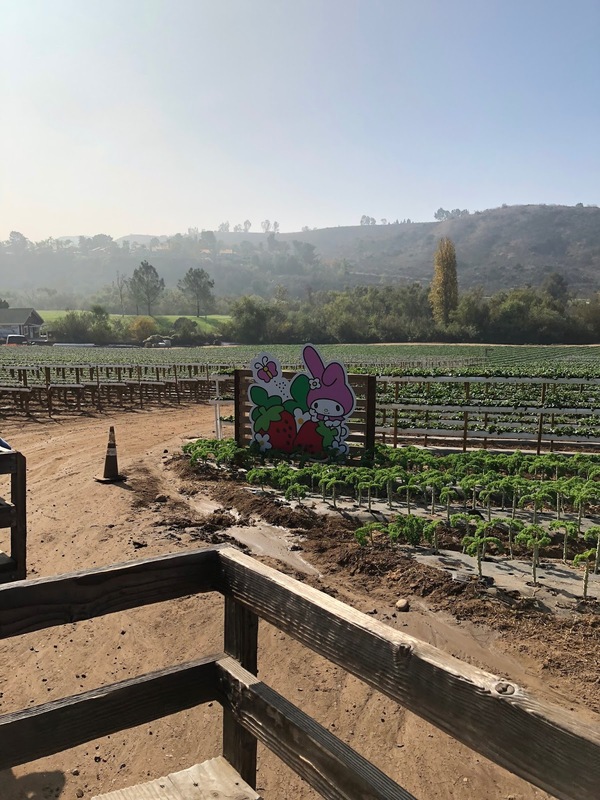 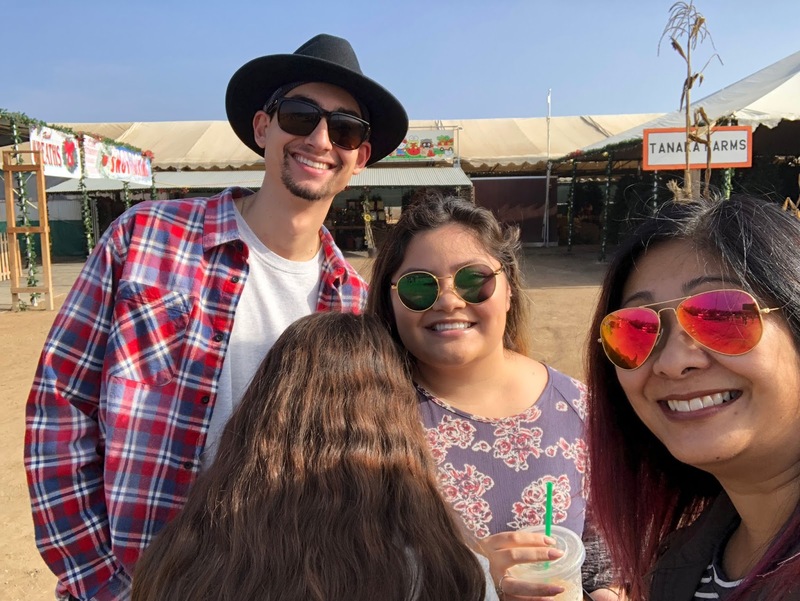 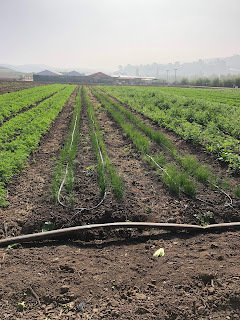 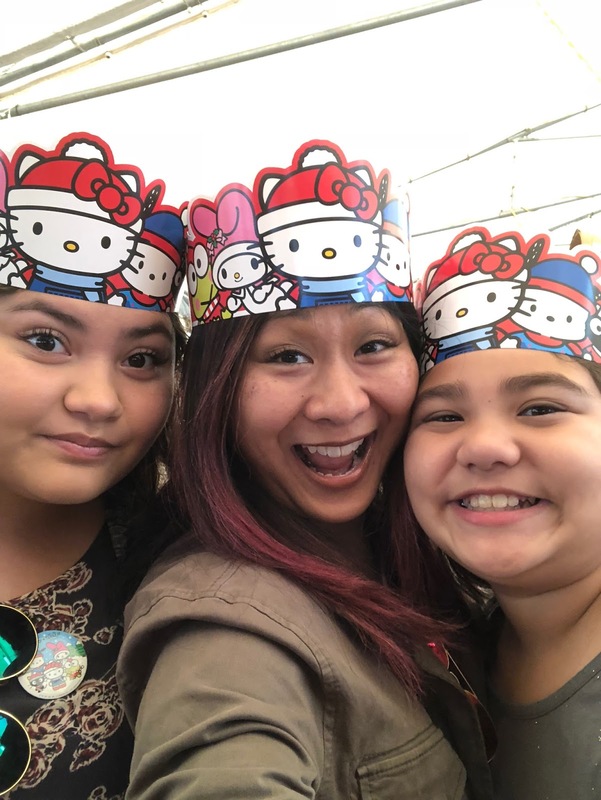 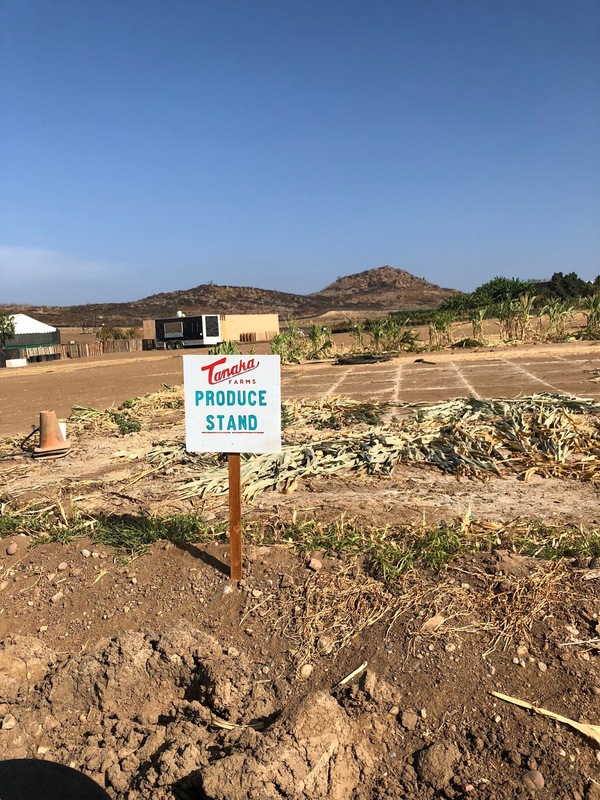 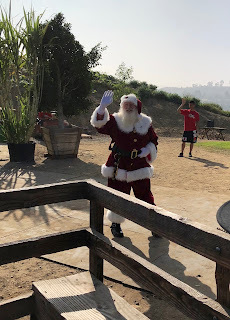 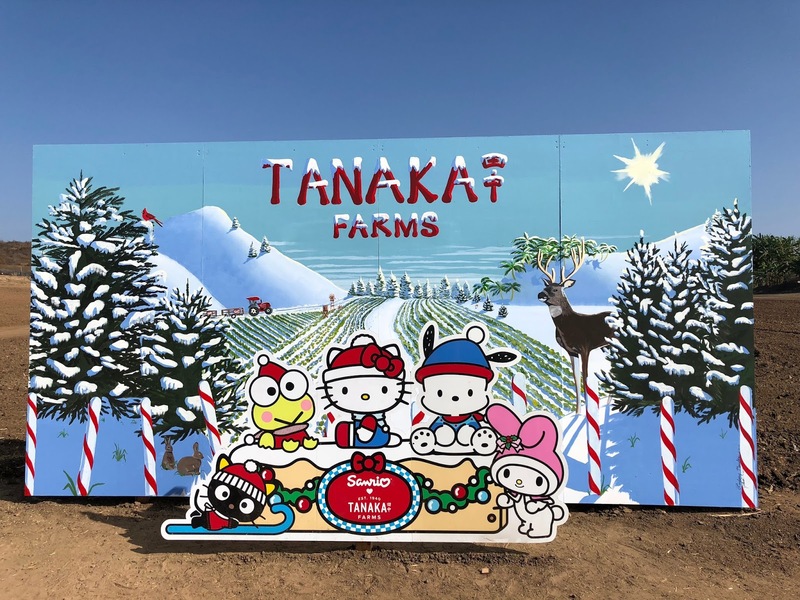 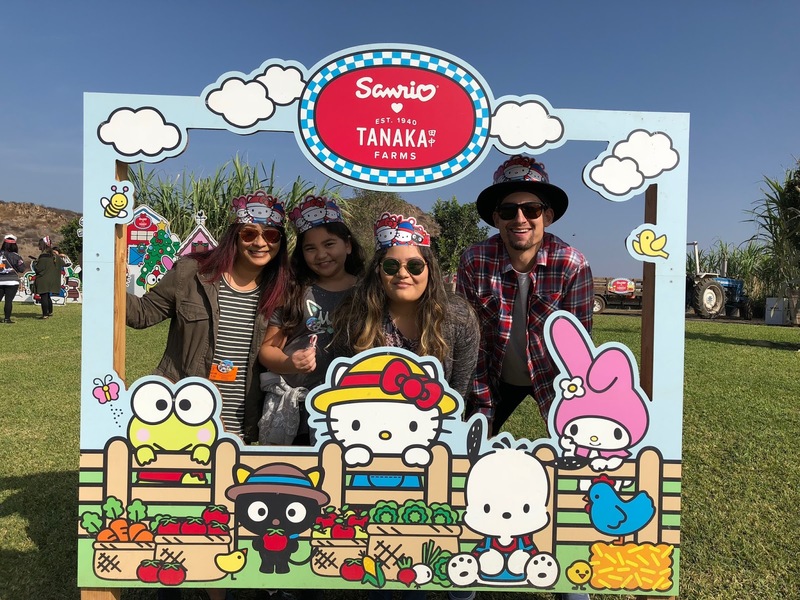 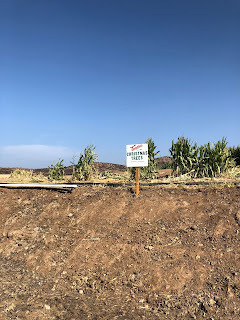 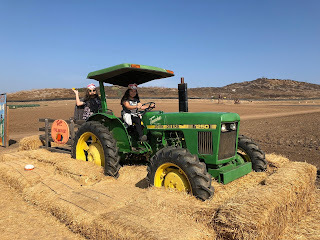 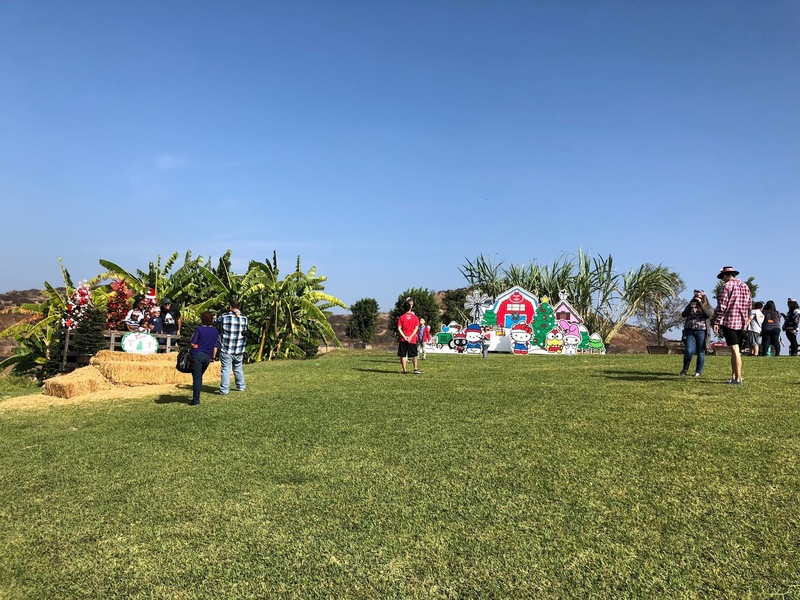 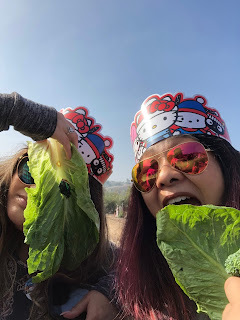 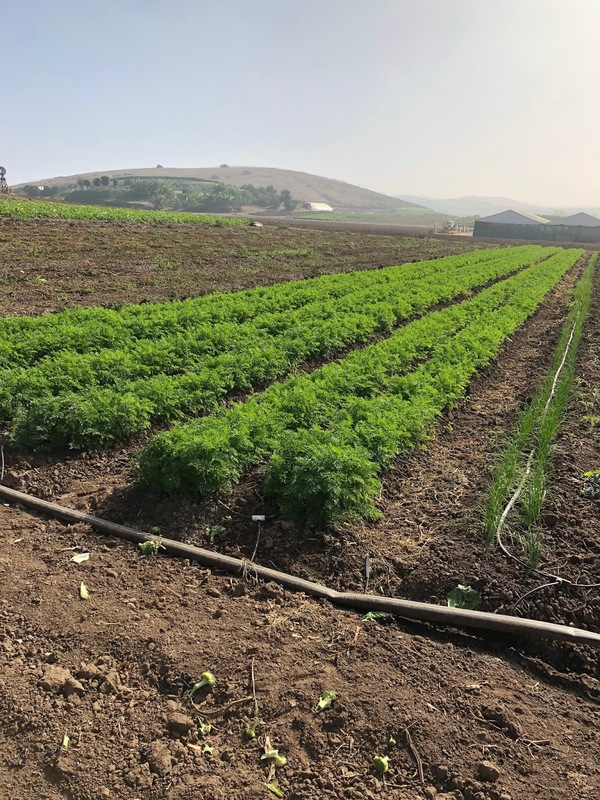 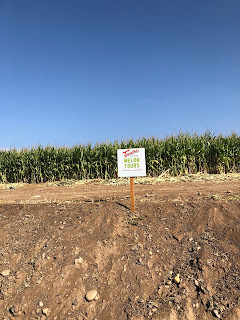 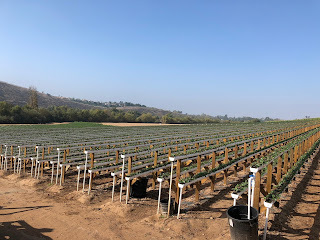 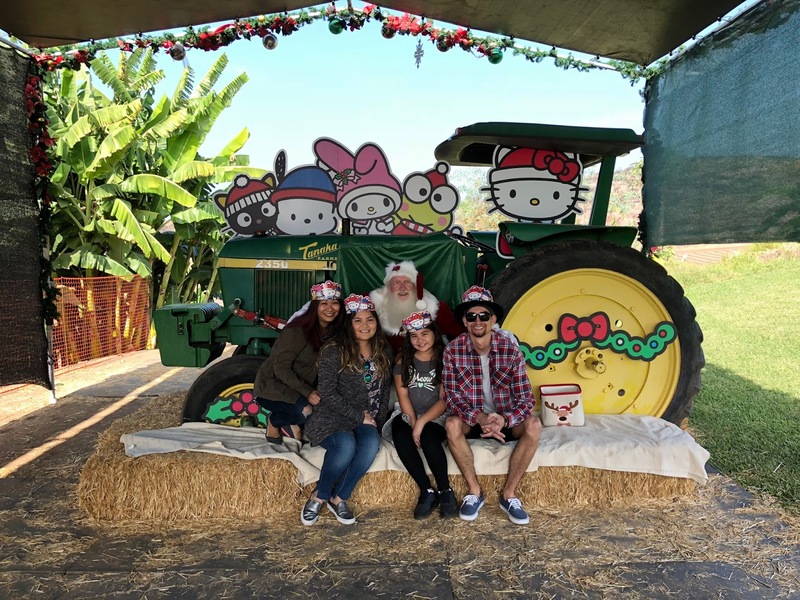 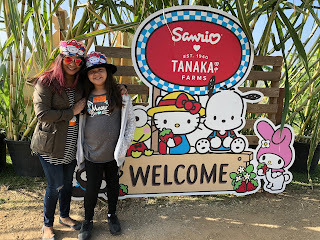 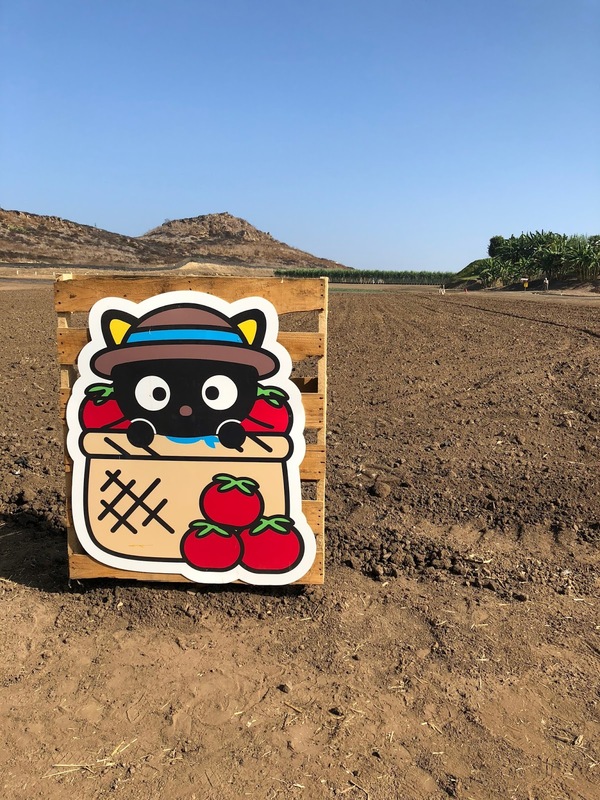 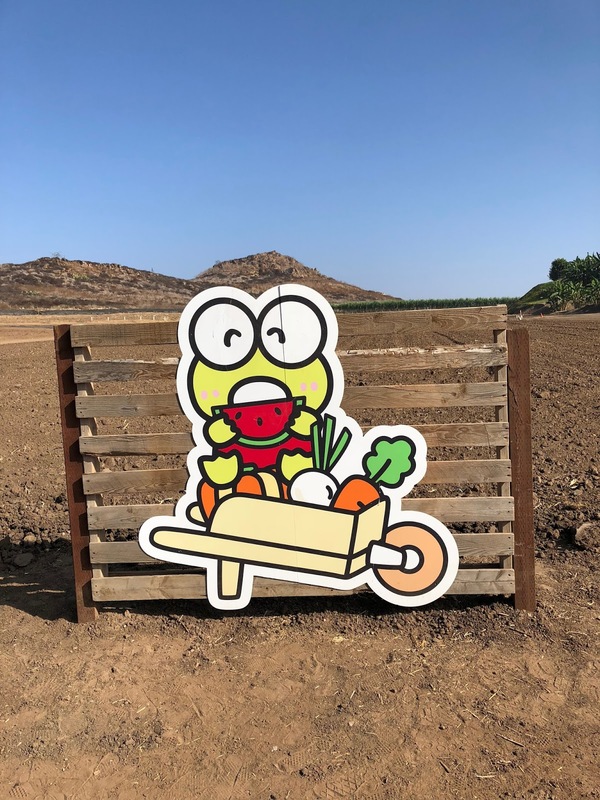 and so when i saw a post from tanaka farms down in irvine about a sanrio-themed farm tour, i thought it sounded like great fun. 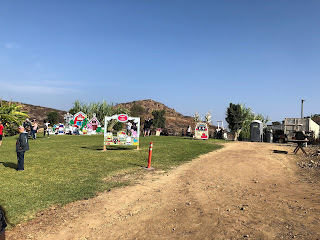 we've only been there once, and i remember it being pretty fun. 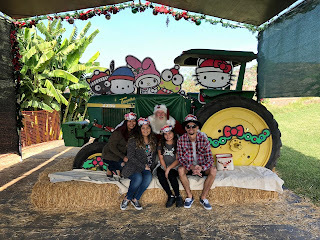 opening weekend happened to fall right at the end of thanksgiving break, and so i figured it would be something fun to do before going back to the grind for a few weeks until christmas vacation. 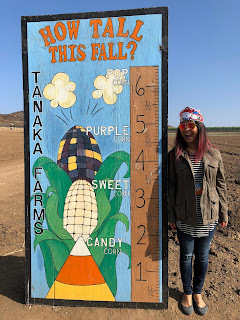 it was a little chilly when we arrived, which was a nice change from the ridiculous 95-degree heat we'd had on thanksgiving day. for some reason, the bean was not feeling it that morning. 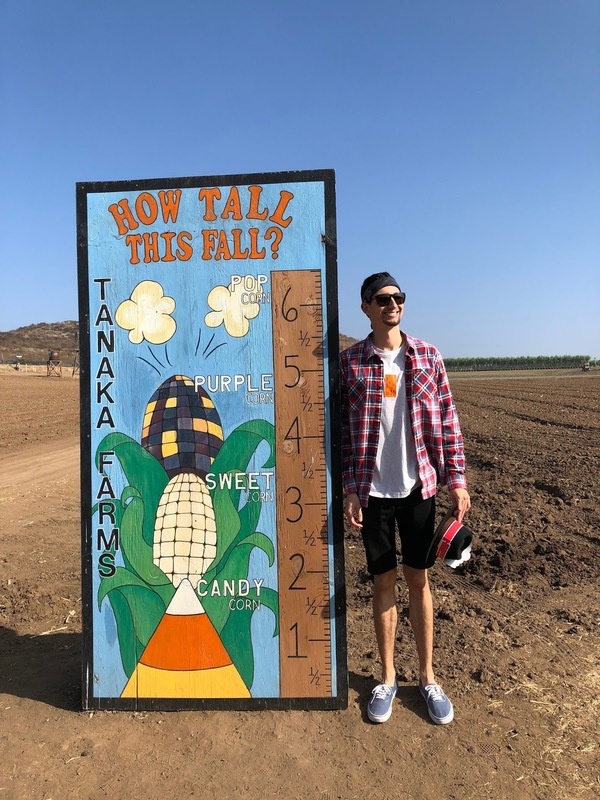 never miss a photo op, right? 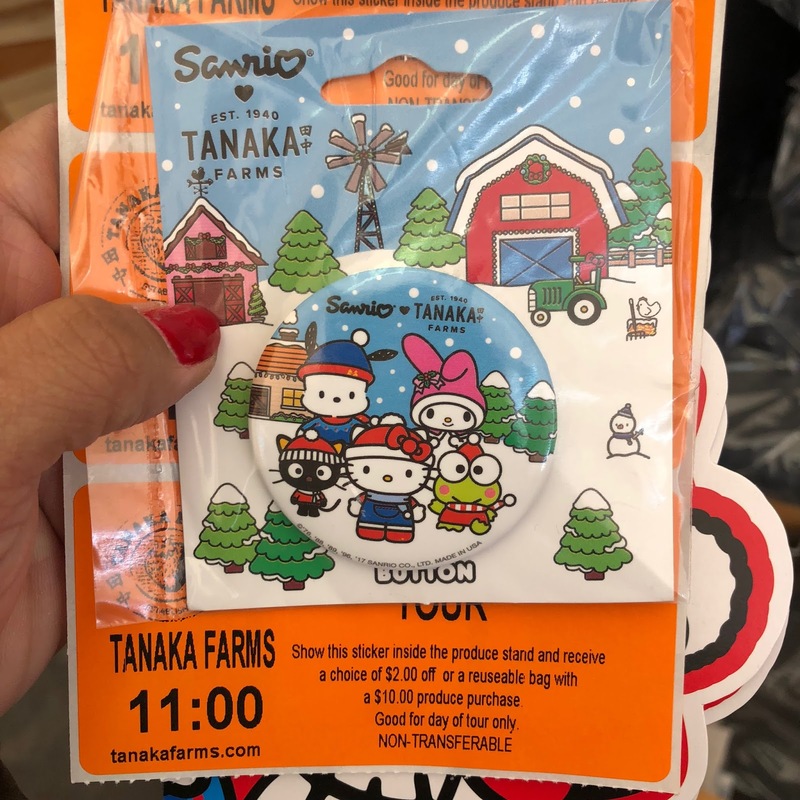 when we checked in we were given our admission stickers and a cute little commemorative button. oh, and the standard issue hello kitty paper hats. the bean cheered up a little at the silliness and actually smiled for a selfie. 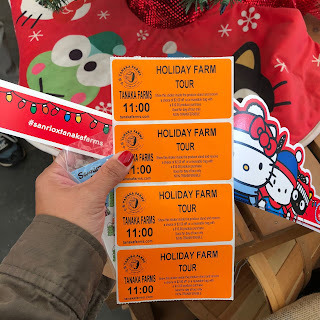 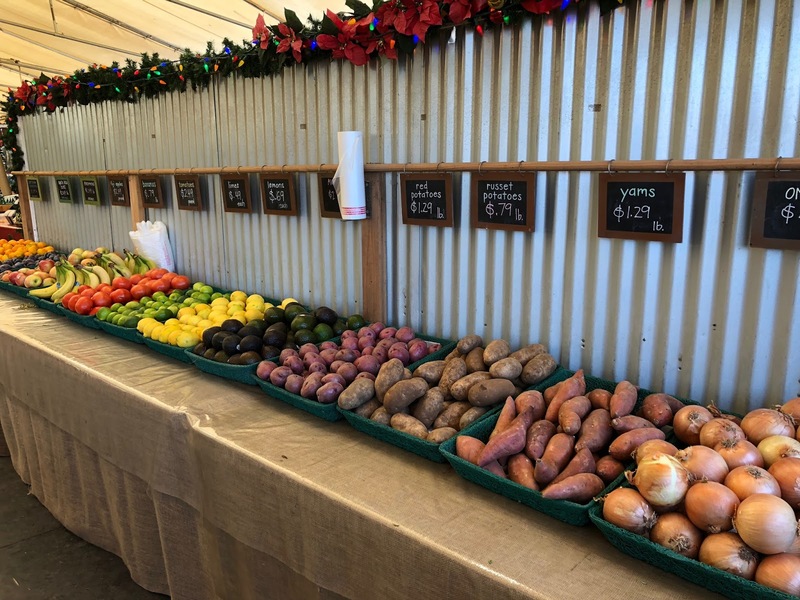 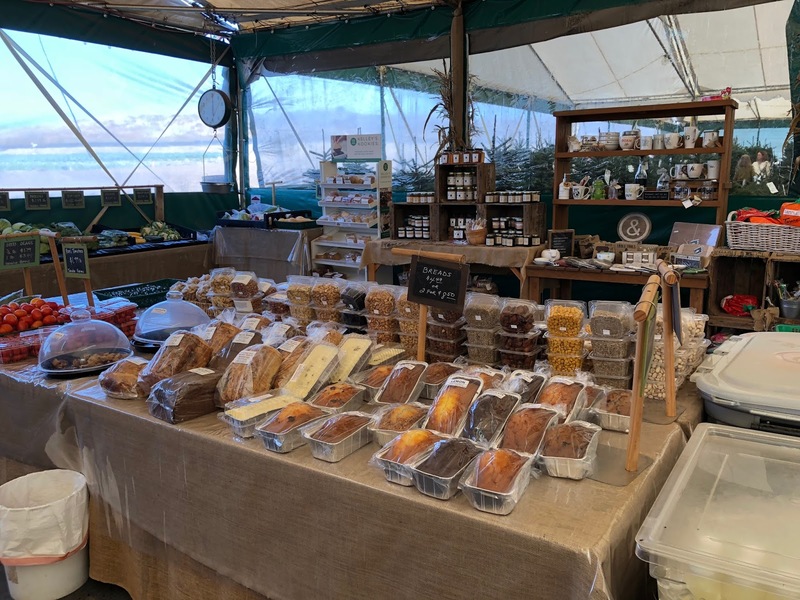 our narrator was full of information about the farm and all the things that are grown there year round. 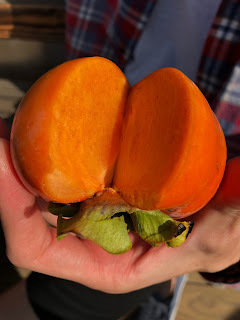 i'm not even gonna lie, i took these pictures because it was cool but i really don't remember what this even is. 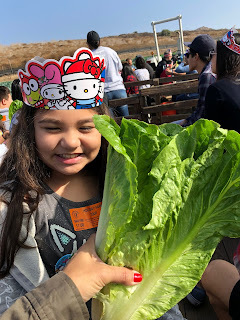 our first sample came in the form of the freshest romaine lettuce we'll ever eat - just picked that morning. 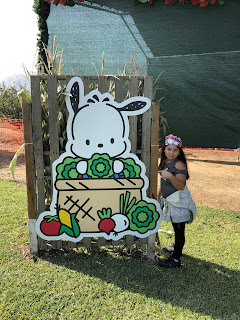 the bean was slightly entertained, but not enough to try a bite. 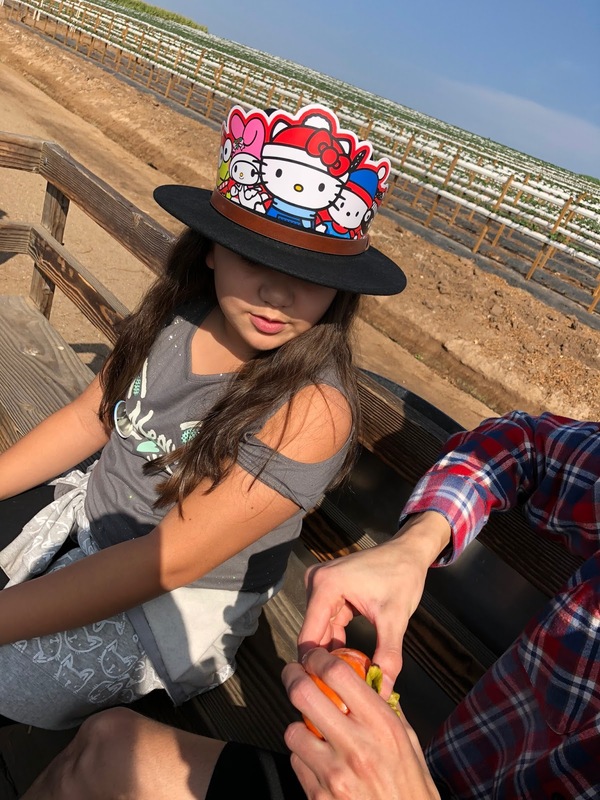 next up came a sample of something i absolutely, positively despise almost more than all fruit combined. cilantro is the grossest thing to me, and putting it in food just ruins it completely. 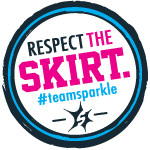 so yuck. but the carrots were delicious. sweet, crisp, yummy. 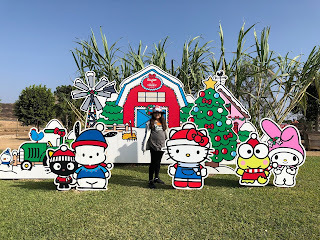 and then we pulled up to a spot where more sanrio photo ops were displayed, and everyone was given a half hour to get out, stretch their legs, take photos, chat amongst ourselves. 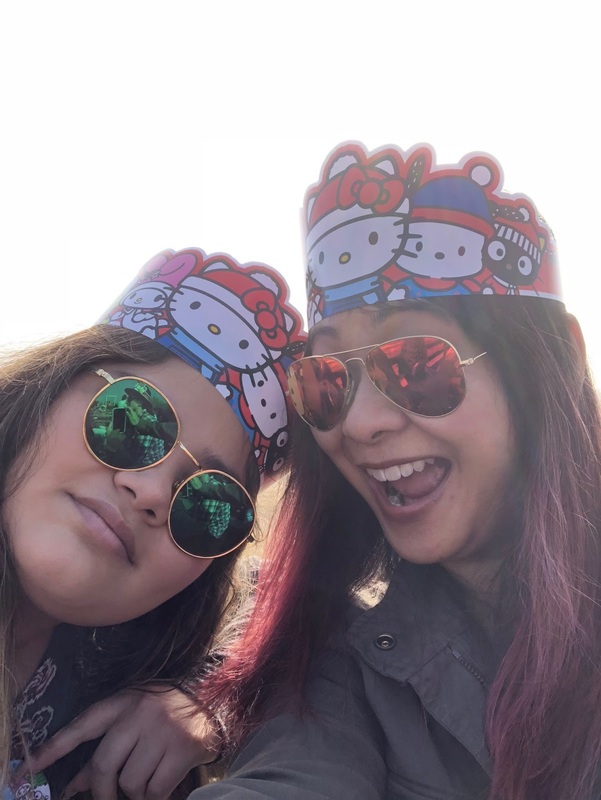 we took full advantage, which is no great surprise to you. 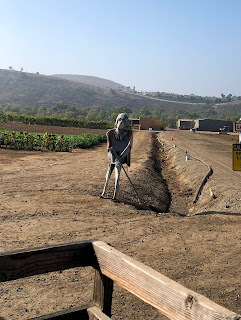 there were a handful of scarecrows around the farm. 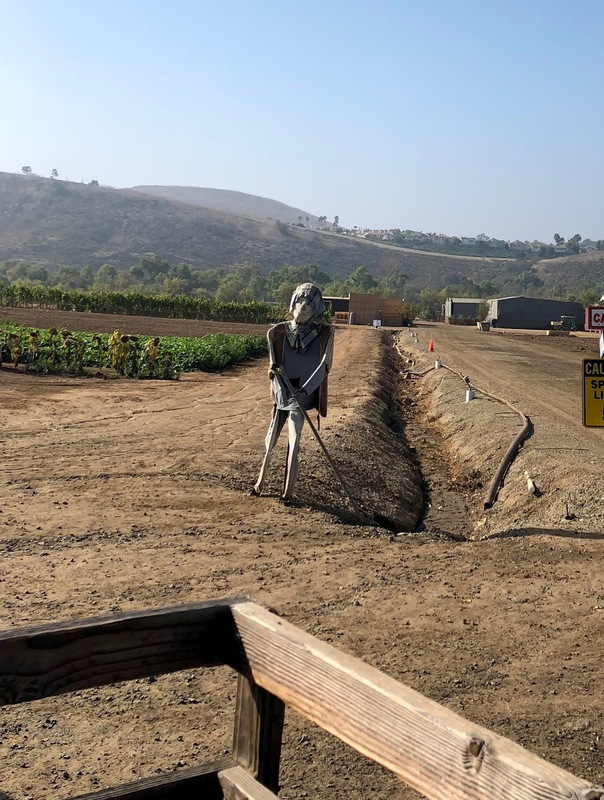 i'm sure they were pretty creepy around halloween, when they do a special pumpkin patch tour. 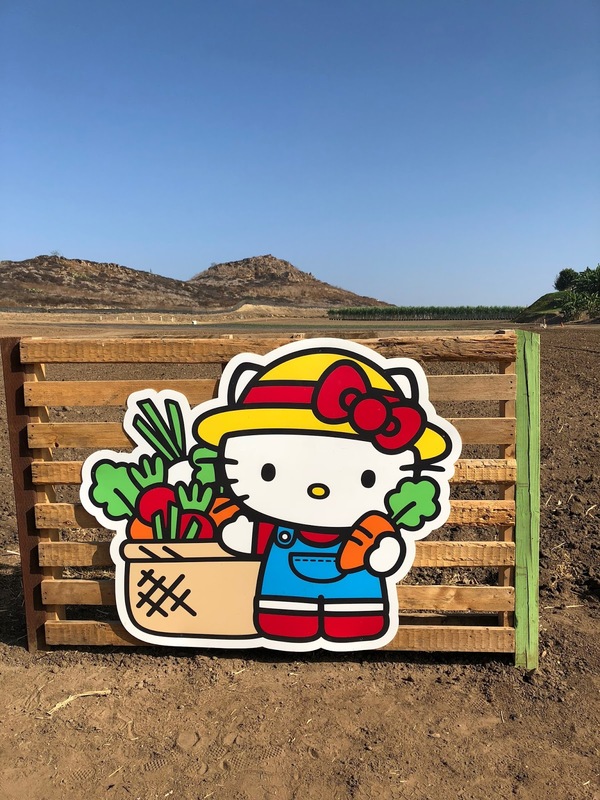 my melody used to be one of my favorite characters when i was little. and then we came upon the huge strawberry patch. 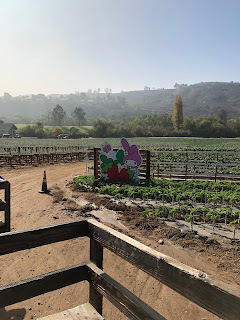 there are tens of thousands of strawberry plants here, and their season begins in springtime - like march or so. 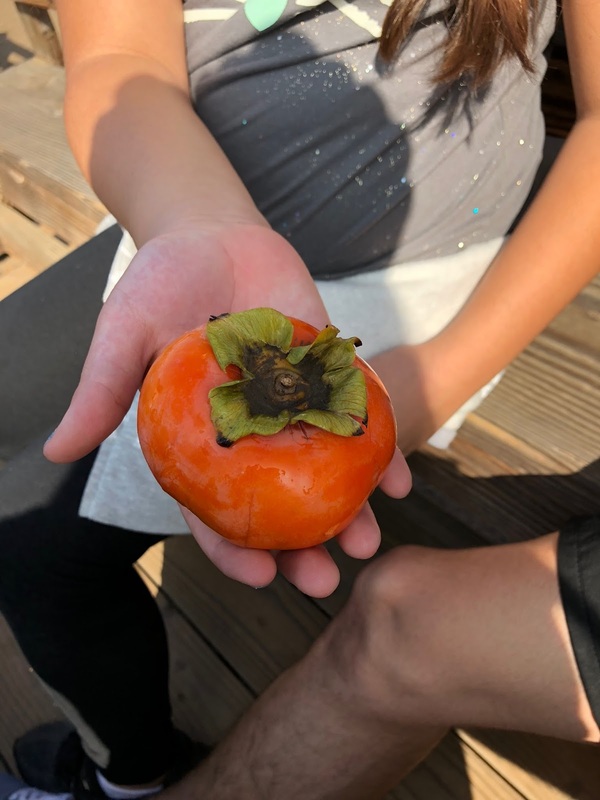 persimmons were handed out next. 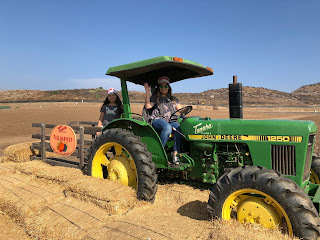 the bean and i passed, but the old lady and her special friend gave it a shot. 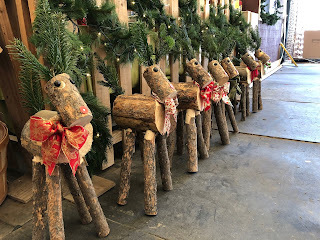 my mom adores these things, but the love didn't go any further down the line. 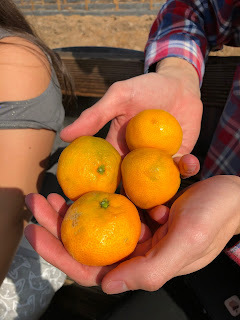 the tangerines were fresh and smelled great as the old lady tore into hers. the tram dropped us off behind the produce stand, where there were some last-minute photo ops waiting for us. 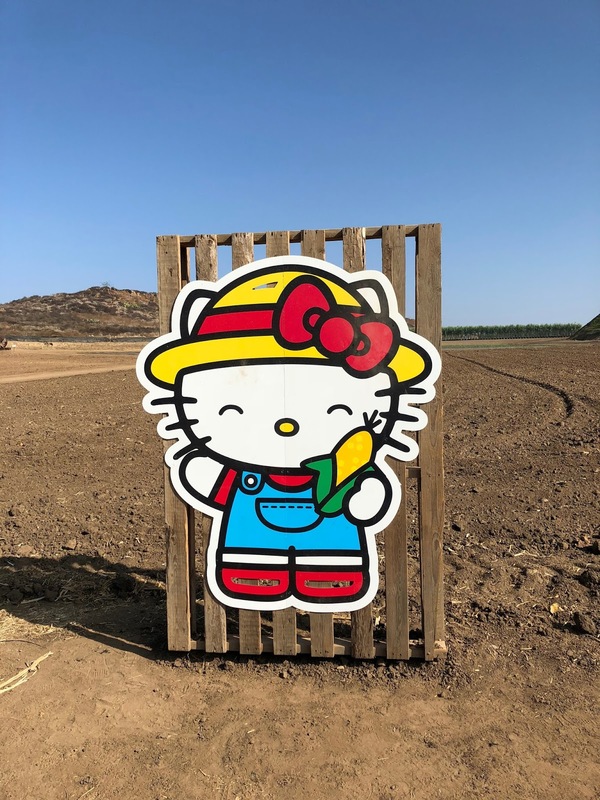 once the bean did it, everyone wanted to. the same went for the tractor. 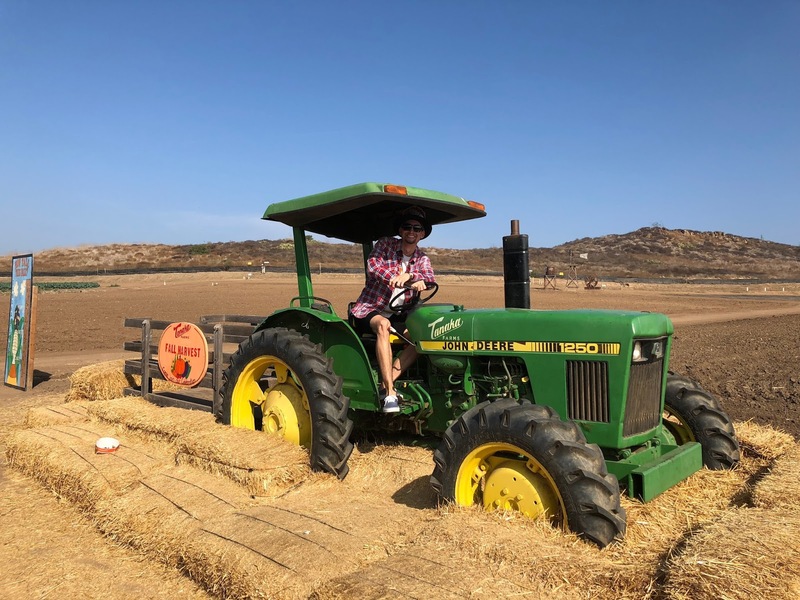 i mean, who doesn't want a picture of themselves sitting on a tractor?? 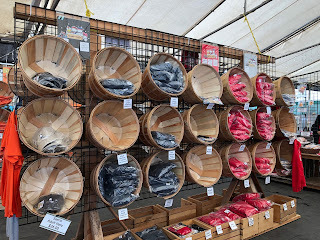 inside, there was a wall o'sanrio merchandise. 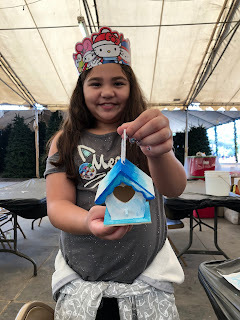 and the bean stopped at the craft station to paint a teeny tiny birdhouse. 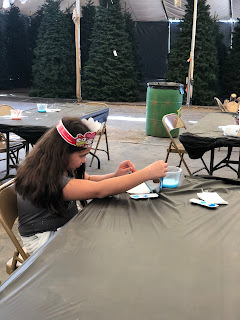 and then when the bean finished her project, we were done. 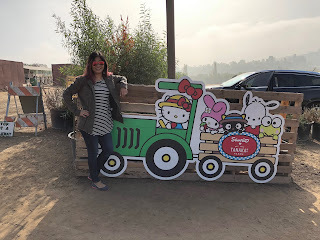 super fun morning! 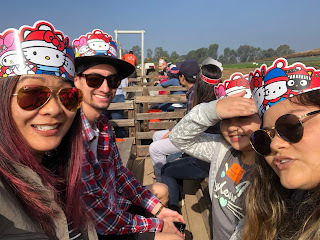 we'd have gone to disneyland after that if we hadn't been scared off by the thought of the gigantic crowds that were sure to be there. instead we headed back home to relax and enjoy our final day of the break. 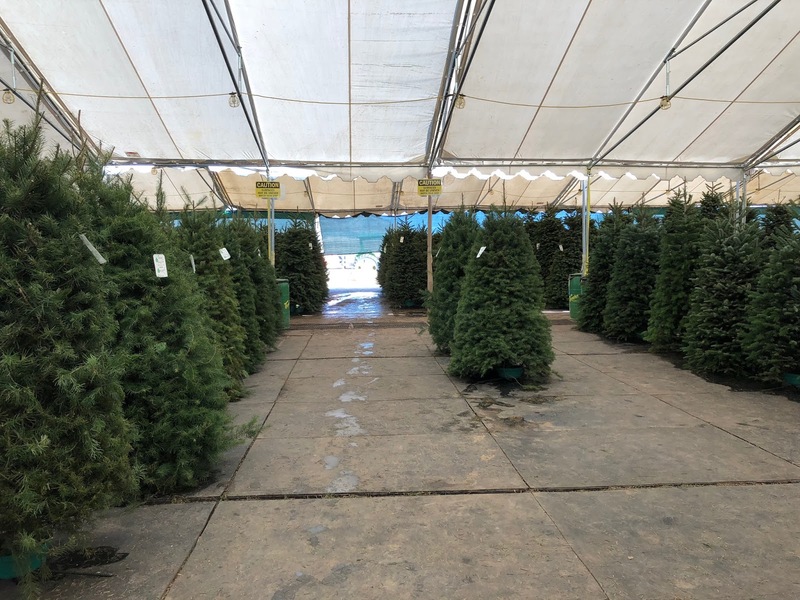 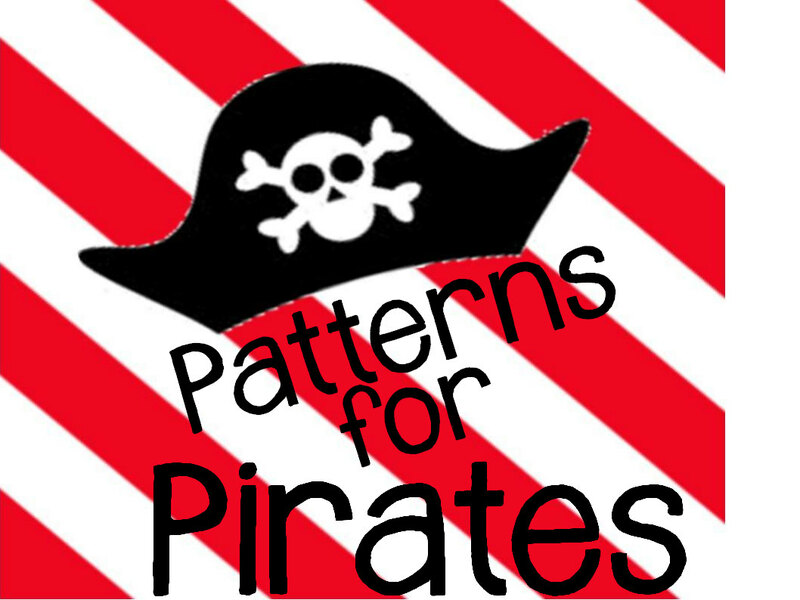 just a few more weeks (which will be jammed with more fun, i'm thinking) and it'll be christmastime!